Every recipe in this book comes out perfect! We enjoyed this recipe thoroughly. The only change I would make is to cook it a day ahead of time so that the fat is easily discarded. Using the thighs with skin, which my husband adores, produces too much oil in the sauce for my taste. I used the slow cooker method, and there was just too much liquid. I really wondered about 2 c chicken broth. I should've trusted my instincts. No need to try this recipe again. I've made this recipe twice, and it was excellent both times. Definitely a keeper. Excellent. I used 2 cups red wine and no beef broth. This was delicious - definitely a keeper! 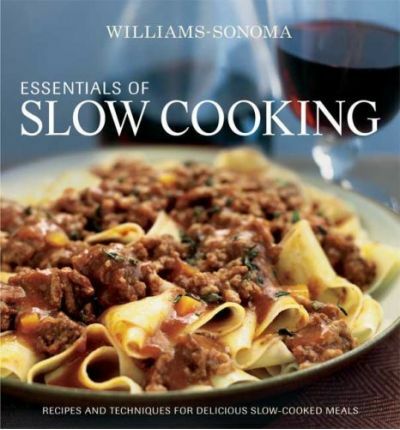 This information-packed volume opens with a brief history of this centuries-old technique and a look at the many ways slow cooking and braising transforms the texture of food as well as enhances the natural flavors. Comprehensive descriptions cover the types of slow cooking and explain every stage of the process, from preparing the food in order to achieve the best results to properly testing the food for optimum doneness, providing readers with all the knowledge they need to turn out delicious and memorable meals. Slow cookers, Dutch ovens, roasting pans, and other important equipment are clearly described and pictured. Five chapters filled with more than 130 recipes follow, offering a range of irresistible ideas for preparing and braising fish and shellfish, poultry, meats, and vegetables, both using a traditional stovetop or oven method, as well as a slow cooker. The chapters begin with invaluable advice on buying and preparing fresh foods, and the recipes, each one handsomely photographed, perfectly balance everyday fare, such as braised Brussels sprouts with pancetta, chicken Marsala, with special-occasion dishes, including veal stew with asparagus, and Italian braised short ribs. Detailed instructions and step-by-step photographs explain the basic techniques of slow cooking and braising such as browning ingredients, carving large cuts of meat, and preparing delicious side dishes. A glossary of culinary terms and ingredients completes this indispensable volume.